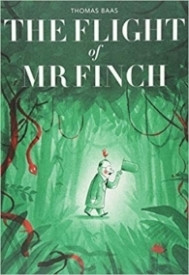 The Flight of Mr. Finch is a sweet story about the power of friendship and the importance of self-sacrifice. Lovely illustrations in a watercolor style flow in a red and green motif throughout the story. The book includes a pull out section revealing a beautiful jungle illustration as well. I highly recommend this book for home and school libraries, ages five and up.